Please note that this page includes Amazon affiliate links. We may receive a commission if you subsequently make a purchase from Amazon. In the first of a new series of interviews with industry experts, we speak to Robert Bullard, the author of Business Writing Tips: For Easy and Effective Results, to find out how people can develop their writing skills for the workplace. Robert wrote the book after receiving positive feedback on his training courses, which help people to improve their business writing skills. He was also inspired during a business networking talk, when a female rally driver encouraged her audience ‘to go outside your comfort zone’. “In response, I decided I wanted to be the top writing trainer in the Thames Valley, and that achieving that would require me to write a book,” he says. In our interview, Robert discusses what holds people back when it comes to writing; he highlights three common writing mistakes; and he shares his favourite publications for those wanting examples of best practice. He also reveals his favourite practical writing tips from the amazing 170 he presents in the book. Secondly, I think a lot of businesses write to impress, which isn’t necessarily a good objective or starting point. People love to highlight when their business was formed, for example. But most customers/readers aren’t really interested in that; they just want to know if the business can solve their problem. What are some of the worst mistakes you see people make in their business writing? Failing to engage the reader, either at the beginning or through the document – failing to make a text engaging and interesting. Without that, people have no reason to keep reading. Secondly, a lot of people write too much: quite wordy phrases, long sentences, or just stuff that doesn’t merit inclusion. And then there are nominalisations – making nouns out of verbs. For example, “There was a failure (noun) by government to solve the problem”, as opposed to saying, “The government failed (verb) to solve the problem”. Good writers make sure they use strong verbs, whereas a lot of businesses turn verbs into nouns, like in the sentence above. The ‘failure’ by government to solve the problem is less impactful than saying the government ‘failed’ to solve the problem. Thank you for your interest. We will be in touch when the next interview is available. If someone wants to improve their business writing skills, what’s the first thing you’d encourage them to focus on? My first, very simple, rule is ‘write as you speak’. I can’t remember which writer it was who said: “Good writing is like a well-educated man speaking”. A lot of people fail to realise that golden rule, whether because of their long-windedness, or their use of jargon or pumped-up words. Just think about it: loads of good literature is written in simple and succinct language. You don’t need empty words to put across powerful points. People should avoid using words with a Latin origin like ‘facilitate’ and ‘utilise’, and legal language like ‘in the event of’ and ‘thus’. They happily write those words but they would never say them. They’re stuffy and create a barrier between the writer and the reader. As I said, the golden rule is: Write as you would speak. What advice would you give to someone who may not be very confident about business writing, but has to do a lot of it in their role? I would go back to something I touched upon earlier: read more quality writing. And I’d recommend The Economist magazine as an example. You don’t need to buy many issues – it’s a big magazine – and it doesn’t matter if it’s an old edition or a current one. It’s written for a worldwide audience, it has a very concise style, and it is very good at engaging, arguing and informing. However, sometimes I like to shock delegates by giving them a bit from The Sun newspaper. It sells in large numbers for a good reason: it’s very good at summarising complex things in everyday language – and having strong opinions. You don’t have to agree with its views, but you can learn how powerful a short and simple piece of writing can be. In general, I’m a big believer that you can learn from other areas of professional writing, whether it’s in newspapers, advertisements or The Economist. They use sound techniques that anyone can adopt. How do you think business writing is evolving? It’s definitely making writing more concise, whether it’s for social media or for websites. If you go back to prior to the Internet, people didn’t have that immediate contact with their customers or their audience. They wrote in a formal style. Whereas now that they have conversations on the web, email and on social media, it’s made their writing much more concise, informal and reader-focused – which is all good. On the downside however, there have also been unwelcome trends, such as text-speak, falling standards of grammar, and more and more jargon – which you get in any office, or any business. People aren’t alert enough to the fact that their office jargon is probably not understood by the customer or audience reading their text. You used to write for newspapers – are there any other lessons from journalism that can be applied to business writing? I’d say be topical. For example, if you’re writing a press release, find a hook on which your story can be related to something already in the news – that way you’re much more likely to get your press release picked up. Likewise, newspapers are very good at being concise. I feel very lucky that I trained as a journalist because when an editor commissions 800 words, they don’t want 820, and they don’t want 781 – so, as you write, you’re forced to evaluate whether or not to include each phrase and sentence. It’s a practice that others can easily apply. Decide for example that your text is going to be two pages long, and scrutinise the merits of including everything you write. Journalism is also very good at introductions. On the front pages lots of people want to read the news; that’s why they buy the papers. But deeper into the newspaper, journalists have got to have really good and powerful introductions – to catch readers’ attention as they flip through the pages. So, in summary, being topical, evaluating phrases and having strong and powerful introductions, are three things that I learnt from journalism. And there’s no reason why any business writer can’t follow these sound principles. Thank you for your interest. We will be in touch when the next interview is published. 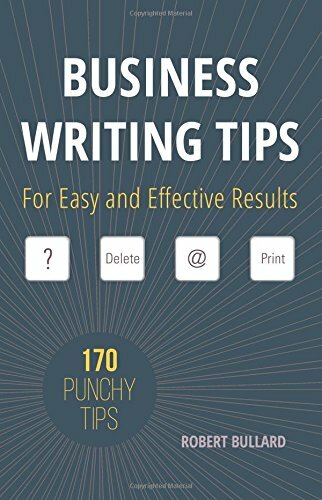 Finally, your book includes a series of 170 tips on how to make your business writing more effective. What are some of your favourites? Quite popular is a little tool I use for structuring my content [page 15]. It’s a technique used by journalists to plan in advance what percentage of a piece to allocate to different sections, and it ensures you don’t write too much on any one section. You can also use it to work out in advance, for each section, how much room there will be for facts, quotes and detail. It’s a very good way of planning the shape/balance of a piece beforehand. That’s probably the most popular tip in my book. However, the tip I am most proud of is a table I drew up that explains the use of commas, but which avoids all technical grammatical terms, like participles, subordinate clauses, bracketing commas, etc. Instead, in everyday language, I explain where commas are compulsory, where are they optional and where are they not needed. From going into businesses, I know that some people waste a lot of time debating commas, and some have very adamant views on their usage – which is not always very helpful. Quite often this energy is misspent, and people don’t realise that they’re just arguing over different people’s style preferences – there is often no right or wrong answer. So, I hope my table provides some time-saving guidance. And finally, a tip to conclude with. My book includes lots of examples of good writing – not my own – that I’ve collected over the years. One is a really well-written advertisement for a shower. Of it, one review of my book wrote that reading the advert was ‘worth the price of the book alone’. Not a bad recommendation! Robert Bullard is a copywriter, editor and trainer in writing skills, who draws on his previous experience as a feature writer for national newspapers. He works for a range of training providers – for the public, private and third sectors, across the UK – and he works for several high-profile clients such as Oxford University, for whom he runs six training courses each year. His training in writing skills covers three areas: detailed topics (e.g. grammar and proofreading), ‘career essentials’ (business writing and report writing) and new and specialist skills (writing for the web, blogging, feature writing and SEO).